Why I read this book: I'd previously read The Life and Opinions of Tristram Shandy and adored it, so I thought I'd have a go at another well-known, well-regarded postmodern novel. If on a winter's night a traveler follows the path of an unnamed reader - referred to throughout the narrative as "you"; that is, from a second person perspective - as he attempts to track down an unspoiled, complete copy of, um, If on a winter's night a traveler. What follows is a mind-boggling work of metafiction that meanders through the genres as the reader in question bumbles haplessly along on his way, blossoming as it does into a love story by way of a thriller of multi-layered complexity. Frustratingly, these elements seemed to conspire against my complete enjoyment of the novel as a whole. While I certainly find the experimental nature of its structure fascinating and intellectually intriguing, I have to admit that I felt fairly alienated by the use of the second person narrative. Although I grant that my discomfort over this specific point may be down to my unfamiliarity with the second person perspective in fiction, it somehow felt odd to be told how I ought to be feeling at each point in the story - as though telling me how I ought to be feeling would instantly make it so. This alone made it especially difficult for me to identify with either the unnamed character that Calvino superimposed onto me, or any character at all within the main narrative arc of the novel. Additionally, I was even less able to invest emotionally in any of the characters from the many disjointed extracts from imaginary books, as I soon got the picture that they would not appear in the overall novel again after the two dozen or so pages of their respective chapters had ended in their cruelly nail-biting cliffhangers. Ultimately, If on a winter's night a traveler is like a delicately crafted work of conceptual art - I can't deny how brilliant the idea behind it is, and even now I am still filled with a sense of how very clever it all is. However, no matter how blown away by the concept I was, it cannot be denied that I found it impossible to be truly engrossed in the book itself, that I was unable to lose myself in its proceedings as I would have been able to in a more conventionally-styled novel or, as it were, in the finer details of a straight-forward canvas painting. With that in mind, I give this book 3.5 stars, with points regretfully docked for its diminished entertainment value, and for reminding me of a "Choose Your Own Adventure" book without granting me the benefit of actually being able to choose my own adventure. I think the structure of this book would unfortunately put me off reading it. I love this book, but I completely understand about the second person point of view -- I don't really like it usually either. Great, thoughtful review! Have you seen Dead White Guy's current discussion of this book? I had to read this book for Modern Fiction last year, and after the first chapter I was completely lost. Sam- Actually, before reading it, I'd thought that the structure would and keep me hooked. But I suppose it just wasn't meant to be. Rebecca- Thank you! Perhaps at some point I'll be able to get used to second person narrative, maybe if I read a few more books written like that. LifetimeReader- No, I'd not seen it... Thanks for pointing it out to me! I've just read it and found that I agree with several of the points made. terri-maree- I'm convinced that Calvino deliberately wanted us to get lost. Haha. I have to agree with you, think I should re-read it now that I have a bit more clarity from your post. I read this in college, and quite honestly, I couldn't get into it. I'm not a huge fan of the second person, and I found that in this book in particular, it aggravated me to no end. 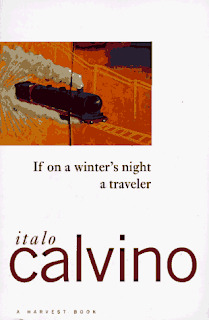 Because the things Calvino wrote that "I" was doing, I wasn't. And the lack of completeness with any of the novel excerpts drove me insane. I kind of just wanted to be like, okay, Calvino, why don't you actually write a complete story and maybe I'll give you some credit. Nice review. Above all else, I like books that capture my interest on a story level. Does that make sense? I want to be entertained, invested, and connected with the story. I want it to be fun. If it lacks that, then no amount of blow-my-mind writing techniques are going to do it for me. I got this at a book sale pretty recently. I didn't read all of your review because I want to go into the novel blindly. Love that I saw this review, though; it will encourage me to pick it up sooner than later. Not sure Tristram Shandy can be considered as post modern, but it sure raised a few eyebrows back then. I guess it put the canvas for James Joyce and modernity though. 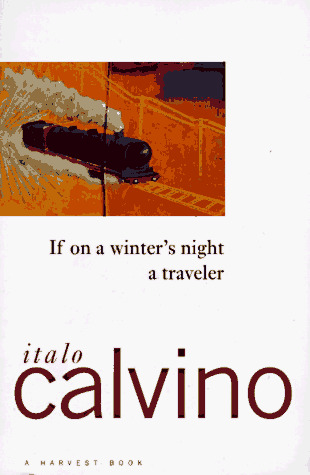 I'm not too sure what Calvino tried to achieve with "Winter's Night..." but merely to experiment with form. It's like a car who doesn't work properly, it looks nice, but it doesnt go very far. The reader's parts kind of did this for me. Ahaha I love that last line. Great review!